35. 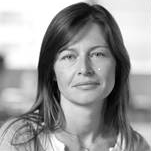 Bérénice Goales, Client Services Director – How to Shape Human Behavior. Client Services Director for Wunderman, Bérénice Goales has +16 years experience developing consumer relationships and managing campaigns to help brands create and develop stronger relationships and loyalty with their existing brand consumers. How does your job fit into the advertising process? I manage Customer Relationship Management (CRM) and digital marketing strategies for our clients. This means that customer focused marketing, which is different from trying to win new customers, it’s trying to develop and create stronger relationships with existing brand consumers. If you buy coca-cola, you’re considerd a consumer of coca-cola. So to communicate with you I must know you’re a coca-cola consumer. When you work on CRM strategy, your main issues are to develop your relationship with your clients so that your clients increase their consumption with your brand – that they visit, buy, and use your product or service more and more. I focus on making customers more loyal. CRM is loyalty. I’m there during the client’s CRM briefing, which is a different meeting than the brief for the advertising campaigns. I consider that an advertising campaign is to use traditional media channels like tv, press, radio, outdoor, Point-of-Sale (POS), etc. Advertising is a mass media approch, whereas CRM is a personalized approach. You have to know precisely who your clients are, their needs, their behavior, and with this data you can develop a very personalized approach to engage a relathionship. You need to send the right and pertinant message. If you are a coca-cola consumer, you can prefer classic coke and your girlfriend prefers diet coke, so it’s a different communication. Loyal brand users have different needs and communication demands than non-loyal users who you want to convince to use your brand. There are always descriminating demographic facts that separate one demographic from another. You just have to know how to identify and then act on them. Advice for setting up a CRM campaign? You can’t just open a Facebook page for consumers and then call it a CRM campaign because you can’t identify loyal users from people who just clicked the ‘like’ button. There’s no way to distinguish or reward. So when you develop a relational website, for example, you use analytics and other metrics to track your user’s behavior on the website. Monitoring your user’s behavior is relatively easy if it is a commercial website because if you change something and can see the difference fairly quickly – more sales, less sales. But this is more complicated if you offer services. What is an advertising campaign you’ve worked on? I worked on a relationship platform campaign for Danone yogurt to create proximity between the brand and their consumers and to reinforce loyalty. We were able to measure with studies the income generated by the program, because we know when we compare a panel of consumers with our target group participating in our program, we can see that they increase the number of yogurts they they buy in a year. What other CRM options are available? Your main objective of a CRM campaign is to capture information about your visiters which you can then use to better meet their needs. This is best done through interaction. Therefore everything about your CRM website should be designed to create a community and draw your consumers into your brand. Create a lifestyle around your brand. For example, Cell phone providers have contracts and CRM campaigns in place offering fidelity points which their customers can cash in for new phones and better options. So when Free entered the French mobile market as a new player using a disruptive business model, their advertising budget was poured into winning clients and market share and stealing clients from the established players such as Orange, Bouygues, and SFR. But that wasn’t easy because for customers to join Free they had to cancel their existing mobile contracts and lose their fidelity points with thier current operators. But once Free established their database, they could scale back on their advertising budget and focus on CRM campaigns to create loyal customers. Not anticipating Free’s disruptive threat, mobile operaters scrambled to increase their CRM campaigns to try to keep their customers from being inticed by Free’s offer. But this tactic can backfire and create a negative effect if converted customers are happier with their new contract and suddenly their old provider begins sending them emails trying to get them back. But, lured to Free by their offer and then later disappointed, the consumer may switch back to their original provider a year later when the original provider sends them a newsletter. This is the importance of gathering data and running CRM campaigns. Opening rate – how many consumers open your email. This is tracked via a tag that is inserted into your newsletter. Click-through rate – how many visiters visit your website through your newsletter. For newsletters sent to your loyal consumers who have voluntarily given you their email address and opted-in to receive it, a good open rate and click-through rate would be between 15-20%. This guarantees a steady stream of traffic to your website. Then there is your headline, visual, and call to action. As you test your newsletter content, a pattern will emerge. Continually test to see what works and what doesn’t so that each newsletter gets better and better. Thirdly, conduct surveys to better identify your demographic. For example, if your target demographic is prodominently married women with children who buy your product or service, then you can predict that her children play an important role in her decision-making process. These predictions give you clues to her behavior which help you better structure your CRM campaign. Fourthly, giveaways always draw a crowd of visiters. Fifthly, offer something specific. For example My Little Paris has a website with a newsletter. It has beautiful photography and offers coupons and special deals targeted for fashion-conscious Parisian girls. This it is quite different from general coupon and discount sites such as Groupon. Sixth, your success is directly related to the tonality of your message. Speak to your consumer as who they want to be, not who they are now. The more targeted and rewarding your message is, the better it is received. My Little Paris targets fashion-conscious Parisian girls. Well, all girls deep down inside strive to be in-fashion, so it only makes sense to sign up for the newsletter to receive fashion deals and ideas. Each time you open a My Little Paris newsletter, you have the sensation of discovering something new and in-fashion – new bars, shops, restaurants, etc. Seventh, brand yourself as select and confidential, at least at the beginning. Later, once you’ve branded yourself, you can open your brand up if you want to the general public without losing that sentimental feeling of exclusivity and special treatment. CRM is exactly that – the ability for a brand to reward it’s followers and loyal consumers. And lastly, build your database. To do this you must get people to follow you on social media or give you their email address. To get information from people you must peak their curiosity and convince them to give it to you. For example, new social platforms that emerge require your email address to sign up and then email confirmation before you can ‘see what is on the other side’. Out of curiosity, people may sign up for your service but might not see it’s worth or don’t get involved. But perhaps 3, 5, 9 months later they receive an email from you, and then all of the sudden they see your product or service’s worth and become loyal users. What is a misconception clients commonly have? If you don’t have a database there is no CRM. If you don’t have marketing campaign tools there is no possibility of CRM because you can’t industrialize the image you send and personalize your campaign. CRM campaigns do require a big budget upfront and a lot of clients need to see the benefits and return-on-investment of this. The problem is that CRM doesn’t give immediate and measureable results like a banner advertising on the internet would. CRM campaigns take time to develop and the return-on-investment isn’t evident until the long run. With advertising, once the advertising stops, the traffic stops. With CRM, once you get an email address and create customer loyalty, your reach is unlimited. So you have to understand that in the long run, mantaining a CRM budget is less expensive than an advertising budget. It’s less expensive to keep a client than it is to win a new client. What’s an important lesson you’ve learned? In CRM, it’s all about your angle, perspective, and the position you take. The most important thing is to always be following trends and consumer behaviors. Listen to your consumers before you do anything. Figure out who your target demographic is, then focus on meeting their needs and creating a presence on the same websites, forums, and social media platforms as they do. The #1 goal for your website is to maximize your organic search so the search engines can get your website on the right search results and in front of the right people. If you’re launching a unique product or service then you may have your own special keywords, but if you’re product or service has the same keywords as millions of other websites, it’s more complicated and your site will be drowned. Find your own business model to win and keep your clients, and keep adapting and adapting so you don’t get passed by by a new market contender. Focus on creating an unbeatable value for money factoring in time and money. Stronger and more established competitors will always be able to offer similar products and services as you do, but at a cheaper price. So focus instead on building and strengthening your brand image. Brand image isn’t easily replicated. Listen to conversations on relevant blogs, forums, and social media platforms to collect information on consumer trends. That being said, following the wrong crowd gives you the wrong information. So choose carefully who you follow and listen to. Set deadlines. When you don’t set deadlines, it’s easy for you to not respect your engagements or to put off launching your important projects. Have an attractive website that shows who you are, your credentials, your market point-of-view, and aggregate your social media content. Public relations. Contact journalists and bloggers to get articles written about you. Set up a knowledge-share page or forum so your readers can share their innovative projects, advice, and ideas with each other, thus creating a community. Posted on January 31, 2013 by Joshua SMITHPosted in interviewTagged account managers, france, interviews, women, wunderman.